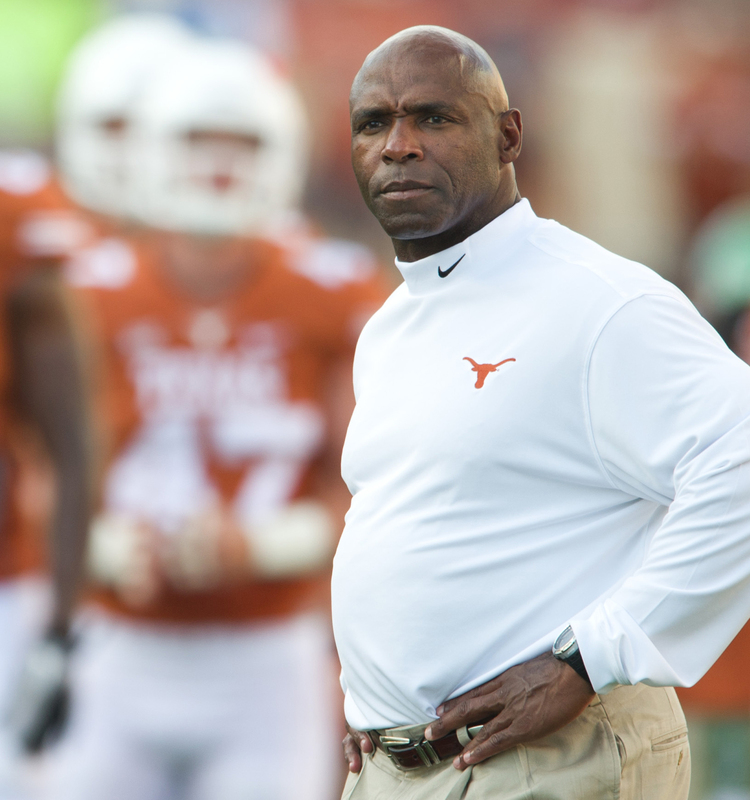 Charlie Strong has a message for college football: He’s still standing. Nine months to the day after being fired as the head football coach at the University of Texas, Strong will take the field Saturday at CEFCU Stadium, prepared for a new journey as the head coach of the No. 19 University of South Florida, which opens the 2017 college football season on the road against San Jose State University. In just three years in Austin, Strong posted a 16-21 record while leading the Longhorns to just one bowl game appearance — a 31-7 loss to Arkansas in the 2014 Texas Bowl. After a 5-7 campaign in 2016, his third straight seven-loss season, Texas let Strong go on Nov. 26, 2016. “Coach Strong represented the University of Texas with class and dignity, and he demanded our student-athletes do the same by adhering to his system of core values. However, after thorough evaluation, the body of work over three seasons has not shown the improvement we were hoping for. This was an important year for our program to take the next step, and the results simply aren’t there, so we’ve decided to make a change,” said Texas athletic director Mike Perrin in a statement announcing the firing. Despite posting the worst all-time winning percentage (.432) by a head coach at Texas, it didn’t take Strong long to land another head coaching job. After the University of Oregon hired South Florida head coach Willie Taggart, who led the Bulls to a school-record 11 wins in 2016, a job opened up in the area that Strong came to know all too well as a longtime defensive coach at the University of Florida, and head coach at the University of Louisville, who found much success recruiting players to Kentucky from Florida. USF quickly hired Strong, not even three weeks after Texas fired him. “I feel blessed to have the opportunity to work with the young men in the USF football program and build on the strong foundation already in place,” said Strong in a statement last December after the hire at USF was officially announced. Before the start of this year’s season, The Undefeated caught up with Strong to discuss his new gig, USF’s star quarterback Quinton Flowers, how Texas shaped him as both a coach and a man, the way he handled a Florida county judge’s criticism of the program, and black representation in the head coaching ranks of college football. How are you feeling heading into this college football season? I feel really good. I look at the team that I have returning, a team that won 11 games last year, which was a school record. Sixteen starters returning, a quarterback who’s very dynamic. He has enough around him where not only can he create plays, he can extend plays. And then I have a defense that’s all about confidence. It’s just a challenge sometimes to get them to play at the level that they need to play at. But all around, we have a really solid football team at South Florida. Now, it’s just about managing those expectations. What’s it like entering a situation at South Florida where the team had a ton of success last season? And how do you plan to continue to build off of that success? It’s not so much that it’s been easy, but the transition, a lot of these guys I knew because I recruited them. When you come into it and you already have a relationship, even though I hadn’t spoken with them in a while, they knew who I was because I had a chance to go into a lot of their homes trying to convince them to come to Louisville and play for me. Not looking at the record, it’s about just me having the respect for them and them having the respect from me. So the transition, I’ve been able to ease through it. South Florida Bulls quarterback Quinton Flowers looks to pass. 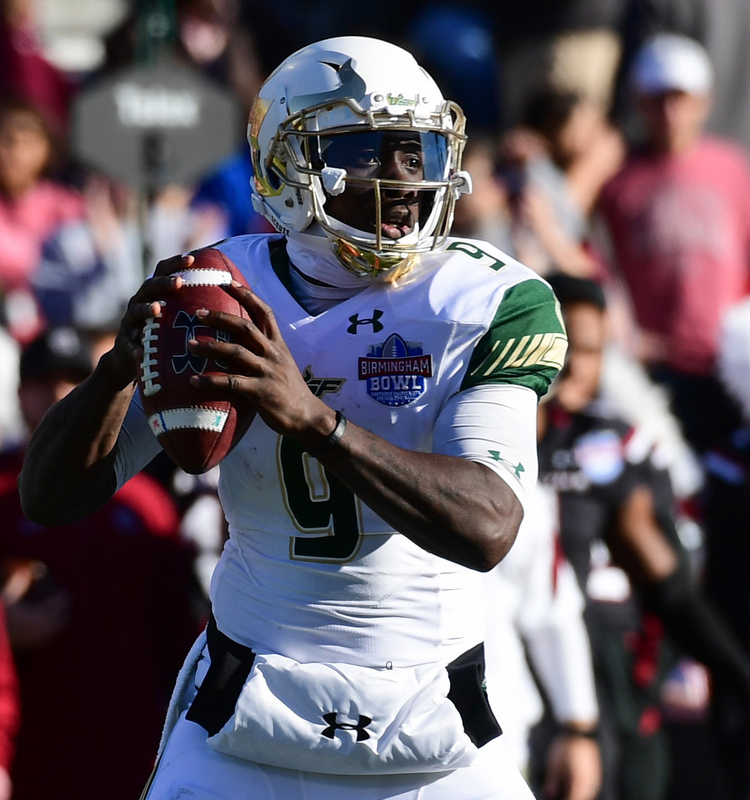 South Florida quarterback Quinton Flowers has made some Heisman Trophy watch lists. What is it about him as a player that warrants that distinction? The thing Quinton does is he just leads by example. He doesn’t say a lot, but he just lets his work speak for itself: 2,800 yards passing last season, 1,500 yards rushing. So he is a dynamic player. He can extend plays with his arm, he can extend plays with his feet. The thing that Quinton does is he just makes everyone around him better. You just like him just because of how he goes about work each and every day, and how his attitude and his commitment is very sound. For you personally, do you regard this season as a fresh start, or simply about getting back to football? It’s a combination of both. I had my experience at Texas, but now to come into this season and into a new program is just exciting. USF has been great. The support has been great. Just to get back into the swing of things has been good. You only spent 19 days without a job after parting ways with Texas. What were you looking for in your next job? And why South Florida? Yeah, I had 19 days just sitting there, but you have a lot of time to just think and reminisce. Question yourself and question what you did. Just break down all aspects of the job. Then, when the South Florida job came available, it’s a place that I was very familiar with, coaching in Gainesville all those years, recruiting in this area and having a relationship that I have with the high school coaches. It’s a program that won 11 games last season and had a lot coming back, so it’s a program that you can contend each and every year for a championship, and that was what was key. Looking back to 2014, what made you leave Louisville for Texas? Louisville is great. I never thought that Texas was better than Louisville. But you look at the job and it’s in the national spotlight at Texas. I feel that, ‘Hey, we can go in there, and year in and year out we can go compete at the highest level.’ Sometimes you have to make those tough decisions. And it was great, because I’ve grown as a coach, I’ve grown a person, and I have no regrets. I had so many great days, so many great moments at Texas. It was a great move for me. It wasn’t so much about the job being hard, it was just about managing and dealing with the enormous spotlight. After doing that, being the head coach at Texas, you feel like you can do anything. What did you learn was the hardest part of being the head coach of Texas? Did you learn anything about yourself as not only a coach, but as a man? Oh, I did. After being there, you know you can do certain things now — you know you can manage external expectations. In all areas as a man, I’m better now. And as a result, Texas has made me a better head coach. Charlie Strong while head coach of the Texas Longhorns. One of the most interesting off-the-field stories in college football this year surrounded the comments USF grad and Florida county judge Margaret Taylor made about the behavior of players in your program. How did you feel about the comments she made? I was disappointed. But with that comment, make sure you have a chance to sit down and talk to me. Because what I do is I take how we manage our program and discipline our players very seriously. But after sitting down and speaking with her, telling her what our program is all about, she has a better understanding now. What made you decide to meet with her? You have to have these discussions when certain things happen, especially when opinions are voiced about you. You need to sit down … with whoever makes those types of statements. And, then, who she was, a judge. We needed to have a conversation one-on-one. Not all coaches would have done that. Did you get the sense that she appreciated you for taking that initiative and talking to her? I think it was just about her hearing how our program is run. And, sometimes, you have to educate so that people will understand what you’re trying to get accomplished. There isn’t much African-American representation in the head coaching ranks in college football — 13 total in the FBS, and seven in Power 5 conferences. What do you make of the low numbers? We just gotta continue to work, and those opportunities are going to come for us. It’s guys like myself, it’s guys like [University of Texas-San Antonio head coach] Frank Wilson, it’s guys like [former USF head coach and current University of Oregon head coach] Willie Taggart. When we win in our positions, and have a chance to be successful, it helps bring along other African-American coaches. What do you think makes it so difficult for black coaches to make that next step and get head coaching jobs in college football? It’s all about relationships and just meeting people, meeting the right people. Also, having a big enough stage where everyone gets a chance to see you and see how you work. What made you want to be a head coach? It’s all about changing young people’s lives. It’s all about having an impact on their lives. And that’s why you coach, because now you have a chance to watch a young man come and grow. Then when he leaves the program, he has a chance to go raise his own family and impact their lives. It’s all about impacting lives in a positive way. What goals have you set for yourself heading into your first season at USF? I just want us to be a really good football team. I just want us to improve each and every day, each and every game. I just want us to come out, play and have fun doing it. Just have us a really good football team at USF. There’s no reason why we shouldn’t. But it’s all about guys playing together, but I’ll have to motivate and lead them.